The side event titled, “Common challenges, common solutions: Collective actions toenhance resilience of Southeast Asian agriculture” aims to articulate regional priorities for climate action in the agricultural sector, particularly in relation to discussions at SBSTA and the COP; showcase national level actions and efforts of member states to support regional priorities, including through South-South cooperation mechanisms; and develop partnerships with relevant organizations and networks to further scale out climate actions to address regional priorities. Organized by the Thailand Dept. 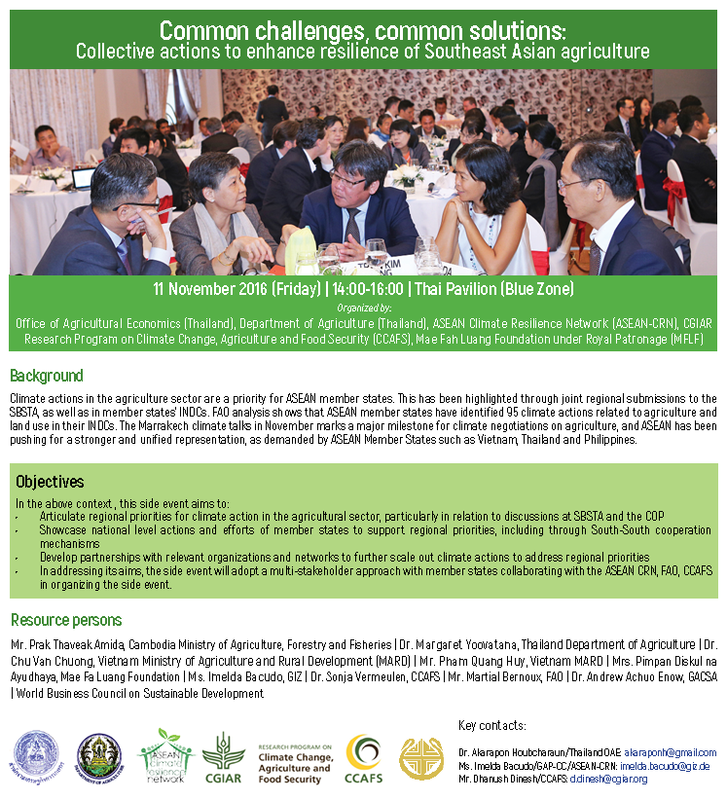 of Agriculture and the Office of Agricultural Economics with support from MFLF, CGIAR Research Program on Climate Change, Agriculture and Food Security (CCAFS) and the ASEAN-CRN, the side event will be held on 11 November 2016, at the Thai Pavilion, from 2:00-4:00 PM.